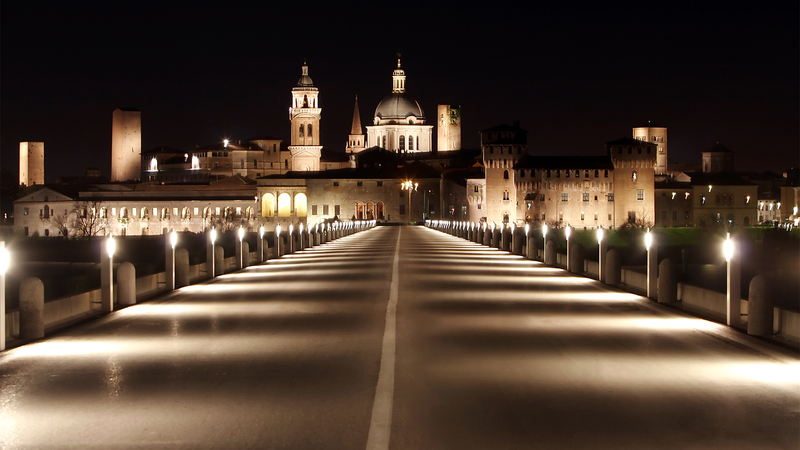 Mantua is one of the most important art cities in Italy. Although it is a small city with around 50,000 inhabitants, the beauty and tranquility of its historic centre make it as fascinating as other cities with greater influxes of tourists. The local administration has been able to preserve and promote the historic centre and its monuments, making it an important destination for noteworthy events, such as the annual Literature Festival, in September, and numerous highly successful art exhibitions throughout the year. Hotel Rechigi is within close walking distance of the main monuments of the city. Mantua – since 2008 a UNESCO World Heritage Site – encloses, within its historic centre, a considerable number of notable monuments and exhibits. The Signoria dei Gonzaga is arguably Mantua’s maximum expression of splendour, comprising, on the wonderful square of Piazza Sordello, the symbolic Ducal Palace, one of the largest Italian court palaces with around 500 halls and rooms and numerous interior squares, gardens and courtyards. Inside is a comprehensive heritage of notable art, including, among other things, works by Pisanello (1400s), frescoes by Giulio Romano and a panel by Rubens. In the nearby late 14th-century Castle of San Giorgio is the famous “Camera degli Sposi”, or “Bridal Chamber”, frescoed by Mantegna between 1465 and 1474. Furthermore, the historical residence of the Valenti Gonzaga Cardinals is now home to the Valenti Gonzaga Gallery Museum. Palazzo Te is a palace built between 1524 and 1534 under the will of Federico II Gonzaga. It is the most famous work of the architect Giulio Romano and boasts numerous frescoed rooms, such as the celebrated “Hall of Giants”, which features the work “The Giants’ Fall”, painted between 1532 and 1535, the “Great Hall of Horses”, with full-size portraits of six of the Gonzaga’s favourite animals, the “Hall of Cupid and Psyche”, the Duke’s dining room, also entirely frescoed and a symbol of love for Isabella Boschetti, the “Hall of Eagles”, the bedroom of Federico, adorned at its centre with the image of “The Fall of Phaeton” from his sun-beamed chariot. Then there is the “Loggia of Honour”, which looks out onto ornamental fish ponds, the “Grotto Rooms” and a fruit orchard. The palace, for its singularity, is considered as part of the great heritage of the history of art and architecture. On the far side of the Ducal Palace are other monuments absolutely worthy of a visit, including the Bishop’s Palace, the Uberti Palace, the Castiglioni Palace and the Acerbi Palace. Crossing the square of Piazza Sordello, you reach the square of Piazza Broletto, which is dominated by the Podestà Palace, or Broletto Palace. Further on is the square of Piazza delle Erbe. 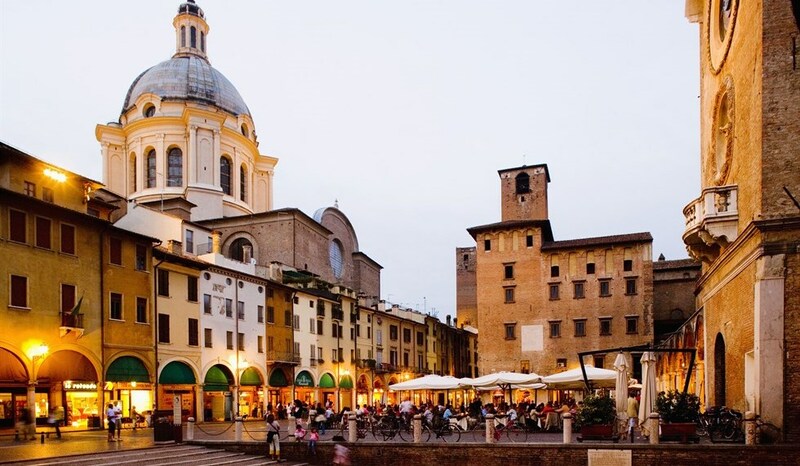 The square, named for the constant presence of a fruit and vegetable market, is enclosed by the rear facade of the Podestà Palace and the Palazzo della Ragione with its neighbouring clock tower. 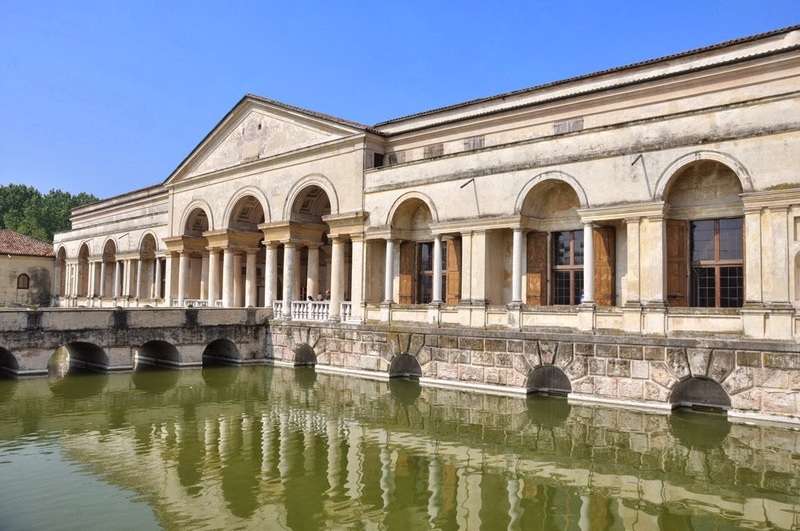 Earth, water, nature, art, history and legends are the essence of Mantua and its surrounding territories, which can be discovered by navigating the lakes embracing the city and the Mincio and Po rivers. In collaboration with Navi Andes, cruises are organized to combine history, nature and culinary traditions, getting to know Mantua and experiencing it all from the water. 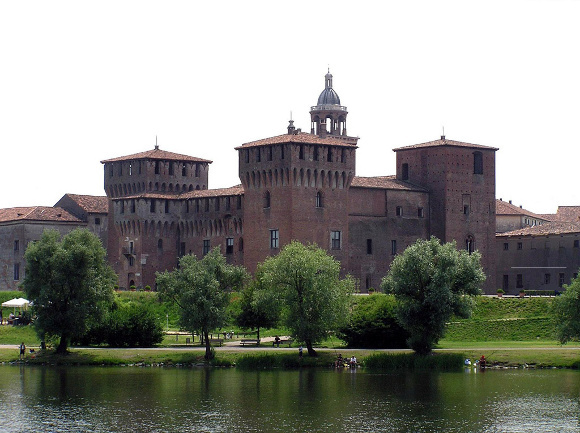 Mantua, along with Parma and Ferrara, is part of a sort of golden triangle of gastronomy on the Po Valley Plain. Mantuan cuisine encompasses the characteristic qualities of court cooking, as well as that of traditional rural settings, feast days and the no less inviting or appetizing fare of convent tables. The typical dishes of the Mantua region have always found the right combination of great peasant genuineness and elaborate aristocratic creativity, the same unique mix which has made the city of Mantua famous throughout the world. Among the great first course dishes of Mantuan gastronomy is Risotto alla Pilota, a pillar of local cuisine named after the “pilatura”, or husking, of rice in large mortar pots. In the traditional recipe, the rice is prepared with typical Mantuan salamelle, fresh sausages sprinkled into a pan of rice on a medium heat after being shredded with a fork or pieced by a wooden spoon. 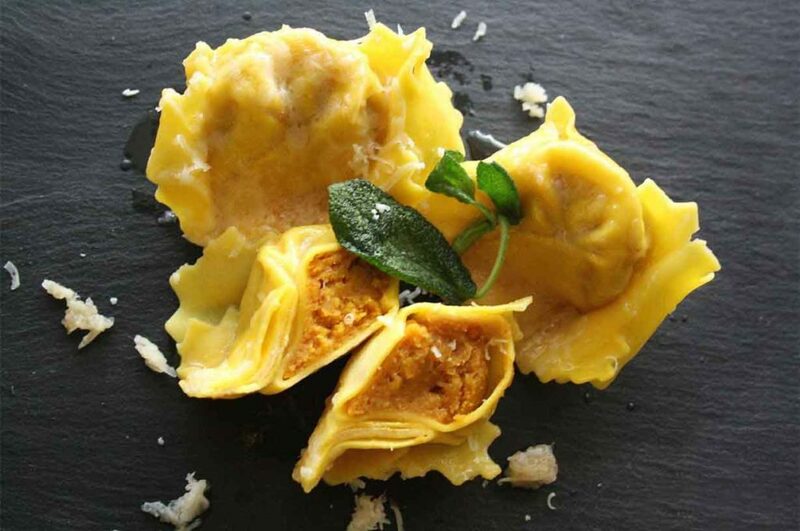 Furthermore, it is impossible to speak of the Mantuan gastronomic tradition without mentioning its famous tortelli di zucca, or pumpkin tortelli, prepared with oven-baked pumpkin enriched with mustard and amaretti crumbs. An mention of honour also must go to agnolini mantovani, served as an appetizer in a small bowl of broth and distinguished from Bolognese tortellini for the precise way they are served and tasted. A discourse apart has to be reserved for desserts, topped by sbrisolona, an almond cake rustic specialty that has long since crossed local borders and is exported as the most typical dessert of Mantua. There are also fine pastry specialties such as Millefoglie and Torta Elvezia, with possible Austro-Hungarian influences.